Teams slow down in the dark, but if it’s a Dark Zone they have to stop altogether as its deemed unsafe to continue. 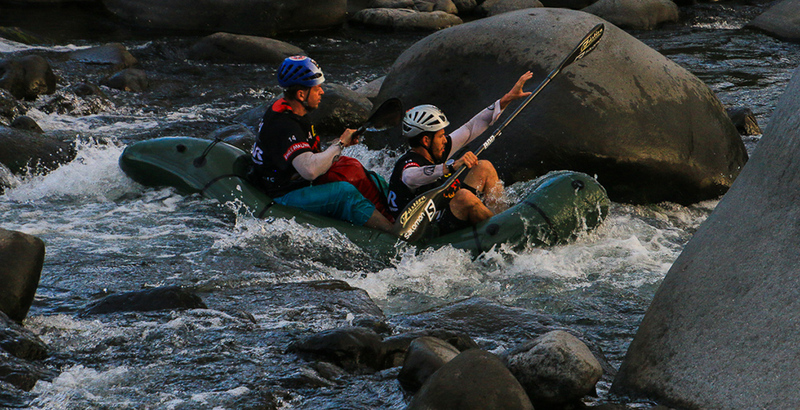 So beating the dark zone on the second stage of the race, pack rafting and trekking in the canyons that sweep down to the East coast from the mountains, has been the aim of the leading teams today. Any who didn’t make it through would fall well behind the lead pack, probably too far to hope to bridge the gap. At the end of a tough day of racing it looks like 16 teams might have beaten the Dark Zone (maybe 17 depending on what is happening with the Swedish Armed Forces team. They appear to have stopped at the point where they could continue walking to the next transition, so maybe they fell just a little short. Rolling back to the start of the day, those teams who made TA1 and could organise themselves to do so, left between 02.20 and 03.00 to trek down to the River du Mat, ready for the lifting of the dark zone at 05.15. On the way they had a 50m abseil and then a swim across a pool before reaching the river. They were starting the day wet, and they were going to be wet all day. Deflating their rafts and carrying them where necessary the teams followed the river down to the coast, finding several checkpoints on the way down to CP8 at the town of La Riviere des Roches. And then … they had to trek back uphill, their packs heavy with two rafts, paddles and helmets etc., to get to the top of the next canyon descent. The end part of this trek was up the switchback road, which was particularly hard on sore and wet feet. The destination was CP9, a small picnic kiosk by the roadside and here teams were briefed to use the ropes put out for the descent down to the water, and to watch for warning signs for 3 difficult rapids. Here they were advised to either to stop and recce them, or to walk around. The Swedish Armed Forces team all laughed when they heard this and said, “We will walk around!” Sam Clarke explained. 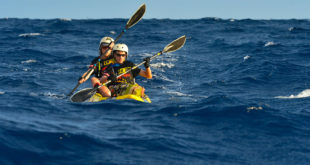 “Our track record rafting so far is not good at all, and I’m much too familiar with the water already.” The team don’t have a lot of packrafting experience and had already broken a paddle, but luckily could supply another for them. The trail down to the canyon wasn’t very clear on the maps or instructions and Haglofs Silva could not find it so they set off on a direct descent below a bridge. They returned some time later to take the right trail, somewhat shaken after getting into a dangerous position. Bjorn Rydvall said to me, “We got to a big fall and almost went off, it was nearly our last race!” They recovered well and beat the dark zone, but lost ground on the leaders. They too were among the break away group now and were in good spirits in Transition two, a floodlit football field in St. Benoit. The joked the weather was perfect for them, “it’s not hot at all!” Said Brazilian racer Camila Nicolau. Not everyone had such a good day on the water. The Estonian ACE Adventure Team walked into CP10 while I was there, carrying one inflated raft and one now ripped and unusable. “We did it right at the start so have walked all the way,” they said. The coped well, got into the TA at nightfall and are currently in 7th place. Those teams who didn’t get out of canyons and rivers covered by the dark zone before darkness fell will be camping by the riverside – but not too close in case of flash floods. (They have to be 8m up.) The restart in the morning but the time spent sleeping does not come off their 12 hour ‘Sleep Card’. 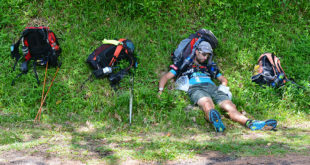 A lot of teams will be doing this, and those at the back of field will be aiming to get into TA1 to get some sleep before they spend tomorrow on the pack raft stage.